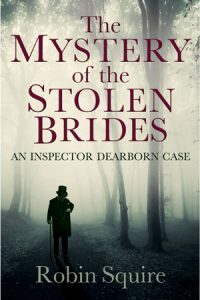 Robin Squire: “I had always seen the book as a tragic Victorian love story and crime thriller, involving the methodical police work of Detective Inspector Dearborn and his young assistant. My great-grandfather was a Thames river policeman in Victorian London (no motors then, they used oars), and my grandfather was a police sergeant in Edwardian London (in 1911 he was one of the coppers at the Siege of Sidney Street in East London, and once told me how he used his heavy police cape as a surprisingly effective weapon against thugs). As a youngster, and later as a published novelist, I was fascinated by his first-hand accounts, which provided authentic background material and atmosphere for the book. Click on the image to visit the Crime Vault.